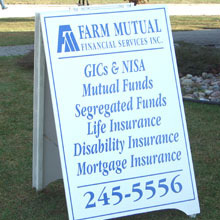 A-Frame signs, sometimes called sandwich board signs, are custom-built units which provide a message on each side of the sign. 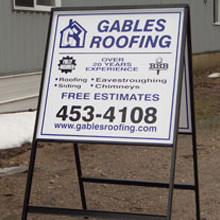 The advantage of these signs are that they can be easily relocated and yet still deliver professional looking messages with attractive lettering and graphics. During the night they can be stored inside to prevent vandalism or theft. 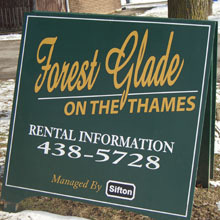 We can build A-Frame signs to any custom size or you can choose from our standard sizes and our Graphic Designer can help you design a layout that works best for your message. © 2019 Davies Signs. All Rights Reserved. Website by Brydges Design.